China state-owned energy group CGNPC Uranium Resources Co Ltd (URC) plans to acquire up to 70 per cent of Perth-based uranium explorer Energy Metals Ltd under a bid that values the target at $119.46 million. The proportional takeover offer of $1.02 a share is being made through a subsidiary, China Uranium Development co Ltd (CUD), and has been unanimously recommended Energy Metals directors. Energy Metals shares last traded at 86 cents a piece after going into a trading halt on August 27 and the offer price represents a 60 per cent premium to the stock's three-month volume weighted average price up to August 26. "The Energy Metals board believes that CGNPC's financial resources, technical expertise and strategic intent to develop its uranium resource portfolio, will greatly assist Energy Metals in its transition from explorer to developer and producer," chairman Oscar Aamodt said in a statement on Tuesday. As part of the deal, CUD will also underwrite a one-for-nine rights issue by Energy Metals at 90 cents a share, which will follow the successful completion of the proportional takeover bid, to raise about $11.7 million. The funds will be used to speed up Energy Metal's 53.7 per cent owned Bigrlyi project near Alice Springs in the Northern Territory. 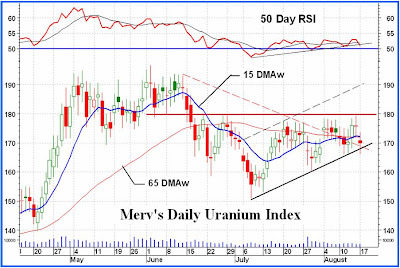 "URC is supportive of Energy Metals' goal of becoming Australia's next uranium producer," Energy Metals said. "It has a proven ability to finance the development of resource projects, including through joint venture projects with large international companies." Energy Metals directors and Jindalee Resources Lt, which holds 40 per cent of the company, intend to accept the bid, in the absence of a superior proposal. The offer is subject to conditions including Australian Foreign Investment Review Board and Chinese regulatory approvals and a minimum acceptance of 50.1 per cent of outstanding shares. Under a deed signed between the two parties, Energy Metals has undertaken to deal exclusively with URC, and has agreed to "no shop, no talk and no due diligence" provisions unless a superior proposal emerges. The bidder's and target's statements are expected to be sent to shareholders later this month. CGNPC is a state owned company supervised by China's Assets Supervision and Administration Commission (SASAC). Set up in 1994, it operates four nuclear power stations and further nuclear projects are under construction in China. URC is a wholly owned subsidiary of CGNPC and aims was set up to establish stable channels of nuclear fuel supply for CGNPC, which has total assets of about $US16 billion ($A18.71 billion). CGNPC also has a portfolio of wind, solar energy and hydro power assets.